He leaned in, looked over my shoulder, and smacked his gum louder than the sea of noise that came from the outside hallway. So, that summed up my brief experience at the American Film Market (AFM), as I was trying to sell my American indie comedy film. I had some notable names attached, but not anything of value for the film buyers at the AFM. Was this the only way to sell a film? The same group of buyers and sellers traveling from one film market to another, peddling film products to foreign territories … Were these the last gatekeepers? There had to be another way … This couldn’t be it. Something didn’t sit right with me. How were they doing it? How were so many businesses making money online? Once you start down this rabbit hole, you’ll be overwhelmed by the amount of information that will find. But, there they were … countless of a regular people who started online businesses, making in the range of $25,000 a month. But how? How could I get into this racquet? 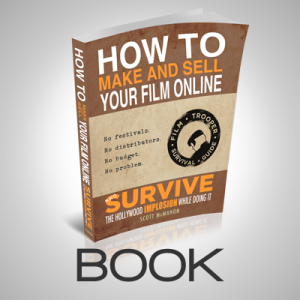 And how … could you sell your films directly online and benefit from all of this? Can you remember where you were when you first saw Vincent Laforet’s “Reverie”? I’m not sure when it happened, but we bought an Apple TV … and our viewing habits changed almost over night. It wasn’t too long before my family stopped buying DVD’s and BluRays. Stopped renting from RedBox … and then watched as Blockbuster disappeared altogether. iTunes, Netflix , and Vimeo became the new norm. 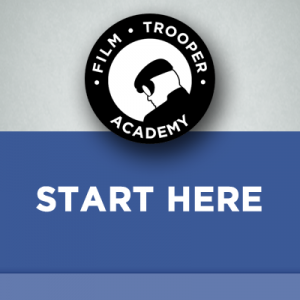 The quest to learn how films get accepted onto iTunes became the new mission. This lead me to learn about … aggregators. Especially a service called Distribber. The service was simple. Pay a flat fee of about $1495 and Distribber would help you get your film file mastered to the correct technical specifications and submitted to iTunes, Netflix, Hulu, Amazon, etc. I couldn’t believe it could be this simple, so in my email correspondence I met a representative, Jason Brubaker. Yes, thank you for answering my questions very thoroughly. platform is quite amazing and revolutionary. the feature filmmaking paradigm is shifting. If Vincent Laforet had shown the indie film community what can be done with a DSLR, then the simple service of an aggregator just blew the lid right off for the entire indie industry. Then, in a matter of months, new direct digital distribution services started popping up all over the place. Aggregators were no longer the only game in town … You as an independent, could easily upload your digital file and start selling your film right away … to the world! As I was putting the final touches on my uber-indie film, THE CUBE, I would read that Jason Brubaker was leading the charge of a new company, called Chill. 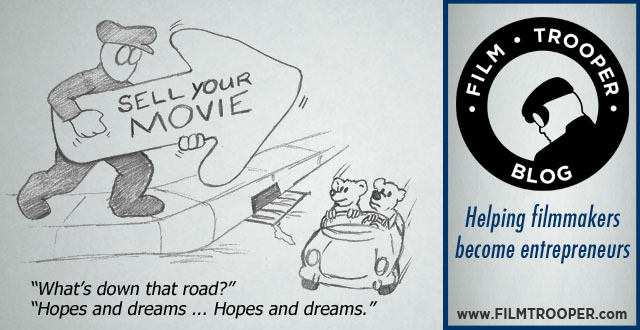 Since film production was no longer a barrier … And film distribution was no longer a barrier … that left film marketing as the last barrier. Jason’s efforts with Chill was to streamline the marketing of films with direct distribution. Unfortunately, the major funding behind Chill was pulled before this idea could be fully realized. 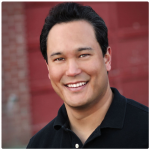 Jason Brubaker, who has worked closely with direct distribution platforms for nearly 8 years now, has been sharing his expertise through his website FilmmakingStuff (dot) com. 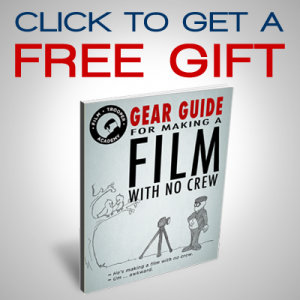 When I finished my feature film that was made for $500 with no crew, I knew that I wasn’t going to be entering it into any film festivals, as that would easily eat up my original budget. Haha. No, I’ve always been interested in creating something and then selling it directly online. 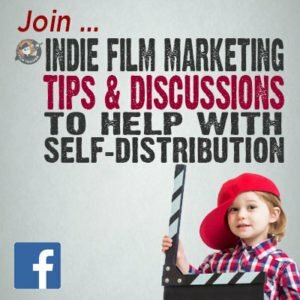 Jason Brubaker offers an online training toolkit, called, “The Indie Movie Producer’s Guide to Digital Self-Distribution”. I was like, heck yeah! I was in … it was a no brainer for me. Bruce Lee is famously quoted as saying, “Knowing is not enough, you must apply”. And applied I did after reading through and listening to all the materials from Jason’s toolkit. Jason says when you’re ready to sell your film online, you need to get rid of anything that can distract your visitors from “buying” your film. This would include sections that gave cast bios, publicity stills, etc. This is fine when you’re building promotion for your film, but when it comes to “sell” … get rid of all that crap. 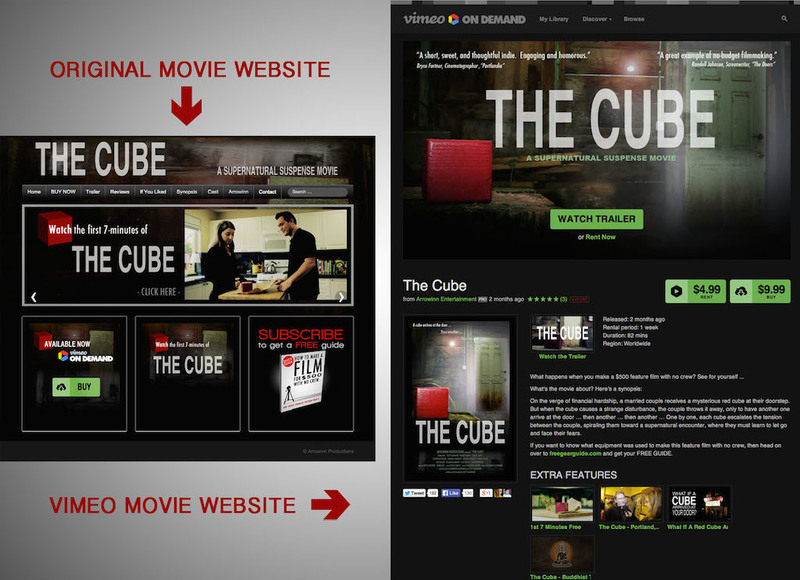 I chose Vimeo On Demand as my platform of choice for my film, THE CUBE. Originally, I had all those things that Jason mentioned on my website. The cool thing is that Vimeo On Demand offers up a very nice looking and functioning landing page for your film. So, I decided to add a simple redirect from my custom URL to my Vimeo On Demand page. Jason clearly evangelizes that we are no longer in the film business, but in the business of audience building. Our films are just the token that our audience gets from us from time to time. I could add a link to the description section, in which I invited visitors to go to a separate (but a memorable domain) to get a FREE gift. Perhaps the biggest thing Jason teaches in the toolkit is the concept and understanding of conversion rates. In “nerdy” web terms, a conversion rate is simply understanding the number of how many visitors come to your website versus the number of them who actually pay for something. So, if 100 people visit your website and only 1 person buys something from you, that’s a 1% conversion rate. The conversion rate helps you, as an indie film producer, to better manage your expectations on what kinds of monetary returns you can get from your film selling online. After I made the minor adjustments to my movie website, added the link for building an email list, and studied the analytics of my conversion rate … I began to see steady returns on the sale of my film. Although, it’s not huge numbers … the small, but steady growth of my email list definitely correspond to my reasonable conversion rate of about 2%. DO YOU WANT TO SUCCESSFULLY SELL YOUR MOVIE? The landscape of independent film distribution is changing so rapidly … I’m shocked that not more professionals are following in Jason’s footsteps. Many of the things that Jason was sharing with filmmakers nearly 4 years ago, are finally coming to fruition. I would personally recommend you invest in the $97 and get Jason’s toolkit. I was fortunate enough to get a consultation call with Jason and expressed my gratitude and appreciation for all that he’s been trying to do to help indie filmmakers. I explained that I’ve been applying the techniques and strategies that he outlined in the toolkit for my film THE CUBE, and have been seeing the results. Jason, kindly offered me a chance to be an affiliate for his toolkit. So … if you made it this far into the blog post, then you must have interest in selling your film through direct (self) distribution. I recommend that you start with this extremely valuable toolkit from Jason Brubaker for only $97. If you decide to purchase the toolkit, right here from this blog post, then guess what? Jason will throw me a percentage of the sale. So, click on the link below and get started at building a successful strategy for selling your film online today!